← Straw That Breaks the Camel’s Back? The threat to Filipino health and environment from the nuclear power plant disaster in Japan is serious and should not be downplayed. This threat should be addressed with truth and precaution and not misinformation. Government officials and the mainstream media repeatedly claim that there is no possibility that the nuclear radiation from Japan will reach the Philippines and that the radiation leak is minimal and poses no significant health risks. This is a gross misrepresentation of facts. There is already a partial meltdown and it is not farfetched that a complete meltdown will occur, if it has not already occurred by the time this article is circulated. There is already a significant breach in the reactor core containment facilities, both immediate and secondary. There is no doubt that significant amounts of radioactivity had already been released into the open environment, exposing thousands of people within several kilometers radius. It is highly probable that this radiation pollution will worsen in the next few days and will most likely reach the Philippines. The claim by Philippine authorities that the radioactive cloud will not reach the Philippines because the prevailing wind direction from the nuclear Fukushima Power Plant plant is way towards the Central Pacific is no reassurance because wind direction can change at any moment. It must be emphasized that, theoretically, no level of radioactivity is “safe.” While these levels are still quite low compared to levels known to be clearly associated with various illnesses due to exposure to radiation, there is a real risk that over time, additional cases of cancer, birth defects, immune disorders, and other illnesses would occur among the population exposed to these low level radiation, especially the more susceptible population groups such as women and children. Furthermore, it is not unlikely that the actual levels of exposure are higher than what is officially reported and given the fact that the situation is far far being controlled, more releases of radioactivity to the open environment is of high probability. The Japanese reactor is reported to be one hundred times more powerful than the Chernobyl power plant, which exploded in 1986 and which resulted in worldwide radioactive contamination which continues until today and which will continue for many years to come. The two stations in the Fukushima region reportedly produce the world’s largest joint amount of energy. If complete meltdown occurs in any of the Fukushima reactors, this may lead to a much worse contamination of the atmosphere than the one that was caused by the Chernobyl disaster. The Union of Concerned Scientists has expressed serious concerns on what is happening to the Fukushima reactors. The first is that the damage to the Unit 2 containment may be leaking gases and or liquids. Normally the reactor building is intended to act as a secondary containment and capture radiation leaking from the primary containment so that filters can remove the radioactivity before it is released to the atmosphere. But the reactor buildings for all three reactors have been damaged by explosions and no longer provide this secondary containment. So if the primary containment is leaking, then a core meltdown could lead to a very large release of radioactivity to the environment. The second concern is that even if the primary containment is currently intact, the Mark I containment system used in these reactors has a known vulnerability to meltdowns. Molten fuel that enters the primary containment area can melt through the wall of the primary containment—a situation called liner melt-through—which would also allow the release of large amounts of radioactivity to the environment. The situation at the Fukushima plant is getting much worse. Larger radiation releases have occurred. The radiation levels around the plants have gotten so high that workers from the plants have been withdrawn. If efforts to cool the reactors are stopped or become completely ineffective, the result may be meltdowns of the fuel in all three reactors. Another concern expressed is the reported presence of mixed-oxide (MOX) fuel constituting about 6% of the core of unit 3. MOX is a mixture of plutonium and uranium oxides. The use of MOX generally increases the consequences of severe accidents in which large amounts of radioactive gas and aerosol are released compared to the same accident in a reactor using non-MOX fuel, because MOX fuel contains greater amounts of more the highly toxic radioactive elements such as plutonium, americium and curium. Because of this, the number of latent cancer fatalities resulting from an accident could increase substantially if there were a severe accident with core melt and containment breach. What is happening in Japan should also serve as a clear signal to the Philippine government to junk completely the efforts to revive the Bataan Nuclear Power Plant (BNPP). The probability of a similar catastrophe occuring if the BNPP is revived should not be taken for granted. The Philippines is vulnerable to earthquakes and the BNPP is situated on the slopes of a potentially active volcano. The reopening of the BNPP would not benefit the Filipino people but instead would expose us to unnecessary risks and potentially horrendous consequences. What needs to be done is to reverse the privatization of the power industry and build sustainable, safe and appropriate sources of energy. At this time, a disaster preparedness program to address the potential health, environmental and socio-economic consequences of the nuclear disaster in Japan should be in place. The government claims to have a radiological preparedness plan but an “alert zero” declaration indicates an inappropriate plan with erroneous assumptions and interpretation of facts. Rather than downplaying the seriousness of the situation and nonchalantly dismissing the risks, the government should expand its radiation monitoring, immediately mobilize resources and implement precautionary measures to prevent or at least mitigate the potential effects of radioactive contamination. Dr. Romeo F. Quijano is a professor at the University of the Philippines, Manila, Department of Pharmacology and Toxicology, College of Medicine and also serves as President of Pesticide Action Network (PAN) Philippines. This entry was posted in Energy, Environment, Nuclear Weapons/Energy and tagged chernobyl, japan nuclear fallout, MOX fuel, phillipines, radioactive winds. Bookmark the permalink. DOST IS LYING TO US! we all know that weather is very unpredictable and they were assuring that the radiation will not reach us? OH COME ON!!! The lies is what caused this disaster in the first place. Now more lies. when will the people damand transparency?? Not only can it reach Phils it HAS!!! jesus people stop trusting government and big corporations. stop looking for your nanny!! 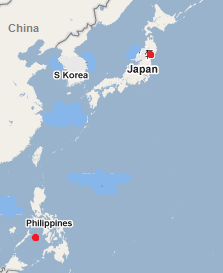 I have a family in northern luzon, should i move them south?